I came across data visualization tool Tableau yesterday and am impressed, especially for what it could mean for link building. Tableau offers user friendly tools for building interactive interfaces to data. For large data sets and for storytelling involving multiple dimensions, their visualizations are very effective and easy to put together. They even offer a free version for bloggers and other digital publishers. It may be easy to think of Excel graphs when looking at Tableau’s case studies but these visualizations are different than what comes out of the box from Microsoft. They are built to be interactive. Instead of asking users to stare at lines and numbers to try to make sense of them, Tableau’s product invites people to start clicking and discovering. We all know that infographics can be a great way to tell the story behind a spreadsheet of dull numbers and as a result, can be great content for link building. With so many infographics out there it can be difficult to make one that stands out. Tableau helps by adding the draw of interaction and movement. For link builders, these interactive graphics are especially helpful. Because the graphic isn’t just a flat image, it’s more likely that publishers will link to your page rather than simply swiping the .jpg file. Plus because it’s interactive, you’re allowing users to discover their own conclusions. If the blogger you’re pitching uncovers a nugget that’s interesting, they’ll have more ownership of the tool than if you simply handed the insight to them. But the best reason that Tableau is worth checking out is that it’s easy and free. If you’ve hired a designer to work on infographics before, you know that it can be time consuming and expensive. One firm that I talked to recently wanted to charge double to make a graphic interactive. With the simple desktop software that Tableau offers, you can set up your own graphics with all the control that you like, produce more of them and spend less money to do it. 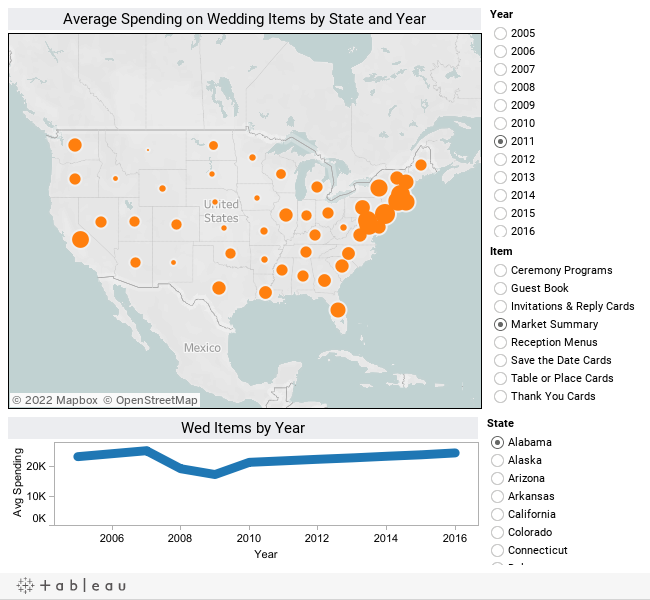 If you have interesting data that you want to bring to life quickly, Tableau is a nice option. We talked a while back about how the moment the customer opens their shipment is the climax of the customer experience and the ultimate single make or break point for brand delivery. By that time, the results are beyond our control as marketers. Once the product leaves the warehouse, the die is cast. Before we get to that point though, we do have chances to influence the final impression. It’s our job to tip the scales in our favor as much as we can. To do that, we must build anticipation for the solution that our customer is waiting for until they can’t wait to tear open the package when it finally does arrive. The only real caution here is to avoid setting expectations beyond what your product or service can deliver. The product has to come first and I’m assuming that we’ve already got something that does its job. And it’s always wise to save a few surprises for the very end. In the meantime though, there are plenty of ways to whet the appetite. I’m sure you can think up many others. These are not cheap marketing tricks though. Anticipation is part of the customer experience. And it’s an opportunity for us to increase customer satisfaction because people want it. The process surrounding a product is part of the product. Once you’ve created a pleasant expectation in your customer’s mind, they’re very likely to have a positive ultimate experience (unless you completely botch the job.) Think of how good a bakery smells in the morning. Once you’ve got idea of a warm, tasty bagel in your mind, and spend 5 minutes waiting to get a fresh one, chances are you’re going to be happy when you get it. Most of the time the reason behind this dynamic of persuasion is cognitive dissonance – people don’t want to disagree with themselves. When you buy shoes online, you’re placing your trust in that shoe retailer. You’ve paid your money and, in a sense, placed a bet that you’ve picked out the right company. You want your decision to be affirmed as a good one and will tend to lean toward that conclusion when the shoes arrive. One of the old sales tricks that salespeople employ is to get the prospect saying yes, even if it’s not directly related to a sale. Once they start saying yes to the small things, they’ll be more likely to keep saying yes. In our case, they’ve already said yes to the big question; they’ve made a purchase. We’re trying to keep the momentum going past the sale and into the product unboxing. Once the customers internalize those messages, they’ll start repeating them to themselves and others, expanding your branding statements even further.What are some ways that you can create positive anticipation that can add to your customer’s experience?